This poem was given to me by Ruby Coull, one of the oldest residents of Catterline. For me it embodied that element of tragedy in verse, which was such a feature of fishing communities, as sometimes whole families of menfolk were wiped out with the loss of one boat. It reminds me that loss lingers on, and this piece written in a hymnal style connects the religious beliefs of traditional fishing communities. This song tells of a mistake by a stonemason who inscribed a tombstone in the old graveyard at Boddin, near Usan. The inscription states that George James Ramsay (no connection!) was born after he died! As a boy, I was fascinated by the rugged coastline stretching North from Arbroath, and enthralled by talks of smugglers and deeds of daring! The watch cottage (The Watchie) on the Catterline cliff top was built for the use of the Customs and Excisemen to help deter and catch the smugglers at their work. Interesting to think that a house built for depriving people of goods and enjoyment, later became the studios of artists whose paintings led to the sharing of continuing enjoyment! The Watchie has now been lovingly restored as a studio haven for artists to continue the long artistic connection with Catterline. On a calm peaceful day looking out across Catterline Bay, it would be easy to forget that world wars did have an impact on all fishing communities. This incident concerning a German U boat and a Gourdon fishing boat called the Bella, took place just off the bay. I wanted to capture some of the futility of war, and this incident offered the perfect opportunity. Our first boat, Selkie, inspired an artwork by local artist David Blyth at the inaugural Catterline Arts Festival. The boat is small and pretty ordinary, so this instrumental tries to capture instead, the seal-woman’s haunting song to lure the unwary seafarer and draw him into the depths. This piece was penned by Pearl Scott, (my Mum in law) after she spent the millennium New Year with Dorothy and I in Catterline, and was impressed by the community spirit and initiative, and the giant flaming figure on the pier. This song was written to reflect the popularity of Catterline and the Creel Inn with locals and visitors alike. It has become a highly desirable place to live and dine! This is the story of the well documented shipwreck of the freighter Granero, which was driven onto the rocks in Crawton Bay in 1933. All of the eighteen crew were rescued, and for three days the Granero was rocked back and forth on the rocks where she foundered, before her back was broken and she sank beneath the seas in Crawton Bay. The Granero was bound from Finland to Grangemouth with a cargo of pit props. Local divers still visit the wreck to this day. This piece was given to me by Belva Ross just a few days before the live recording. The poem was written about her father by his close friend Herbert Gove, and tells of a life and travels centred around Catterline. This piece is set in a gully called the Sheriff's Kettle on the Fourdon to Johnshaven Road. The Lairds of the Mearns were unhappy about the level of taxes imposed by the Sheriff of Glenbervie. They petitioned King James, and were told "Make soup of him" and this is exactly what they did! The Mascot was the last remaining working fishing boat in Catterline until the 1990's and crewed by Catterline fishermen, latterly by John Watt and Jim Moir. The Mascot now has an honorary place in the harbour at Catterline. This song attempts to capture the history of the Mascot, and it's past and present prominence in Catterline. I came across this lovely story some years ago. Adam Christie from Cunningsburgh in Shetland, spent the majority of his life in Sunnyside Hospital Montrose, where he died in 1950. The story is remarkable and had resonance for me with the Catterline artists, as Adam exhibited talents in sculpture, painting, prose and music, which would fit the description of "artist extraordinaire," a term applied to people who exhibit artistic talents, but have had no formal artistic training. I had already started writing this piece, as the news came through that the Todhead Lighthouse beam would be switched off from July 2007, and have dedicated this track to the 110 years of a safe beacon above a dangerous shore. Each lighthouse has a unique lighting signature which differentiates it from all others. The Todhead signature was four beam flashes each lasting 2.5 seconds, with a 30 second interval. My thanks to Steve Hannah for his poem, “The Light” (written just after the live recording session of this album at the Creel Inn). It gives a poignant introduction to the two instrumentals for which the Todhead signature was the inspiration. The sedate pace of Todhead Beam is contrasted with the high level of activity captured in the fast moving Braidon Bay. As a boat owner myself, I am conscious of the part the pier plays in leisure pursuits today, but also conscious of the hard life of the fishing community to whom the pier was central to work and life. I also feel that for visitors to the harbour, it gives a historical working perspective. 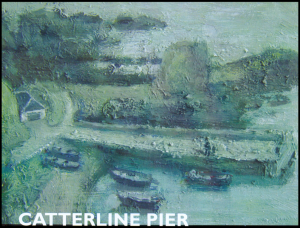 "Catterline Pier" is a collection of 12 original pieces by Dave Ramsay which capture events and historical information on Catterline village, its pier and surrounding areas, all along the coast to Dave's home town of Arbroath. Dave is an active member of the Catterline Harbour Trust, and has produced the CD to raise funds for the Trust and also to promote the work that the Trust does in preserving Catterline's historic pier and harbour. The CD contains a mix of poetry and song which describe major milestones and events in the history of the pier at Catterline, and was recorded live at the Creel Inn in front of an audience of local people connected to the stories. In keeping with the local flavour of the project, Catterline artist Stuart Buchanan has provided an oil painting of Catterline Harbour, to be used for posters and the CD cover. Willie Watson, Graphics Designer, who has a strong association with the village has produced the graphics and text for the project. Dave's own sleeve notes for the CD (shown right) give a taste of the CD. Alternatively, you can order and pay online via PayPal just by clicking on the button below. Martyn Steed, Ian McIntosh of the Catterline Harbour Trust; Robert Lindsay, (Creel Inn); Aberdeenshire Libraries; Shetland Museum; Stuart Buchanan (original painting "Harbour"); Willie Watson (Graphics); Brian and Evelyn Watt; Ruby Coull; the late Jim Moir; Montrose Library and Museum; Maggie Law Museum, Gourdon; Ceri Webster; Arbroath Signal Tower Museum; "The Gentle Shetlander" by Ken Keddie; Aberdeen Journals; Steve Hannah; Ed Littlejohn; Dorothy Miller; Pearl Scott; Neil Mathewson, Mill Recording Studio, Banchory. Extensive thanks to everyone who contributed research materials, anecdotes and support for the Catterline Pier project. Submitted by stephen on September 5, 2007 - 20:13.